I've been reading about early textiles and clothing in the book "Women's Work: The first 20.000 Years: Women, Cloth, and Society in Early Times" by Elizabeth Wayland Barber. 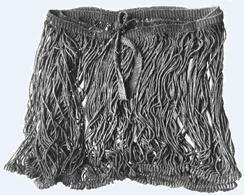 I found it fascinating that the "string skirt" may well be the earliest form of textile clothing. The evidence is found in carved figures of women wearing decorative skirts made of string. One bone figure of a plump women wearing a apron like skirt had been dated to around 20.000 BC. But there is no way of knowing how much earlier such a garment was worn. The skirts of these figures varied, sometimes a front apron, sometimes back while others went around. As string or rope deteriorates in the elements without these little figures we wouldn't have known about these ancient garments. The surviving examples of string skirts are dated to around 1500 BC but they seem much like those on the early carved figures. They don't appear to provide for either modesty or warmth. Instead they seem to be for decoration. They may display decorative knotting around the bottom as in the pictured skirt while others are decorated with tubes of bronze at the end of each string. It appears the love of adornment began a very long time ago! In time weaving was developed to the point where woven clothing was worn. The earliest surviving woven piece dates around 3.000 BC but it was made with advanced weaving techniques so we have to assume weaving had already been done for a very long time. So there was a period when both string garments and woven garments were worn. We know that in time a woven tunic was worn under the skirt perhaps at first for warmth but eventually for modesty as well.